by Michael J. Connor, Ph.D. I recently acquired three male Egyptian tortoises (Testudo kleinmanni) that were part of a consignment seized by USFWS at Kennedy Airport. The animals were seized because, as most male Egyptian tortoises are, they were under 4 inches in length. Federal law prohibits the routine commercial sale of any turtle or tortoise with a carapace length of less than 4 inches. In response to the many enquiries about these tortoises stemming from the recent flood of importations, here are some of my notes on their care and observations on their behavior. Coming from areas with a mild climate on the edge of the Mediterranean, these tortoises are active throughout the winter. Opimum air temperatures for them are reported to be in the 70°s. They may become distressed at higher temperatures, and may estivate during the summer in the wild. I soon learned that mine were uncomfortable during hot spells, becoming lethargic above 85° F. I house them indoors at night only during excessively cold or hot weather. Their terrarium is lit by a full spectrum fluorescent lamp for 14 hours a day, and has a substrate of rabbit pellets. Heat is provided by an under-tank heater in one corner of the cage, and when additional heat is needed, from a blue incandescent bulb mounted in an aluminum reflector. Generally, they are housed outdoors in a 12 foot by 12 foot outdoor pen, planted with grasses and shrubs, and provided with brick "caves" as retreats. Outside they are very active, particularly in the mornings, and make full use of the space provided. 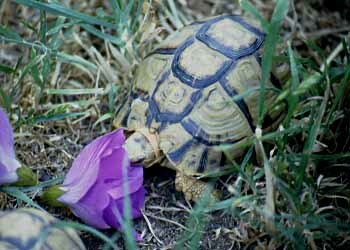 Out in their pen, ignoring the piles of dandelion flowers and leaves I had placed there, the first items my tortoises ate were flowers of the tree mallow, Lavatera assurgentiflora, that had fallen into the pen from an adjacent bush, followed by Bermuda and crab grass. Bermuda has remained the staple. Now that fall has arrived (early December, here in Los Angeles! ), a favored food is fallen leaves from the Almond tree that grows in a neighbors yard and that blow into the pen. When the weather requires that I keep them inside during the day, I offer a similar salad mixture to that that I feed my other tortoises (green leafy weeds, tree mallow leaves, rose, hibiscus or dandelion flowers, grated carrot or sweet potato, mixed with rabbit pellets to provide additional fiber). This salad was refused for the first month, but is now readily consumed. Unfortunately, none of these plant species are readily available in the USA. The 3 tortoises defecate daily. The feces are firm, and similar in shape to those of desert tortoises - round at one end, and pointed at the other. Again, like desert tortoise feces, the pointed end indicates the direction the tortoise was traveling in! However, as may be expected from their diminutive size, Egyptian tortoise feces are tiny. One of the most unusual behaviors exhibited by my Egyptian tortoises is in the morning when placed outside on dew-laden or water-sprayed grass. They bull-doze through the short grass sipping up dew drops as they go! They do this by moving their snouts up the blades of grass, lapping up the drops by opening their mouths slightly and moving their tongues inside their mouths. This drinking activity may last for at least 30 minutes. They have consistently refused to drink water when offered in a dish. Male Egyptian tortoises have much longer tails and are smaller in size than the females. Few cases of captive hatching have occurred outside their natural range, mostly from eggs laid by imported gravid females. The Jersey Zoo reported the first successful captive breeding in 1991. The males are reported to vocalize during mating. One afternoon shortly after I acquired them, I was very surprised to hear one of them vocalize (a very mechanical sounding chirrup) without being anywhere near another tortoise! I have heard him repeat this behavior several times.